Enjoy the rich flavor of beef stock with Thrive Beef Bouillon. Beef bouillon granules can be added to warm or boiling water for use in soups, gravies, or beef dishes. Thrive Beef Bouillon is vegetarian and contains no gluten, which makes it great for individuals with special dietary restrictions. You'll find dozens of uses for this kitchen essential. Add taste without adding stress! 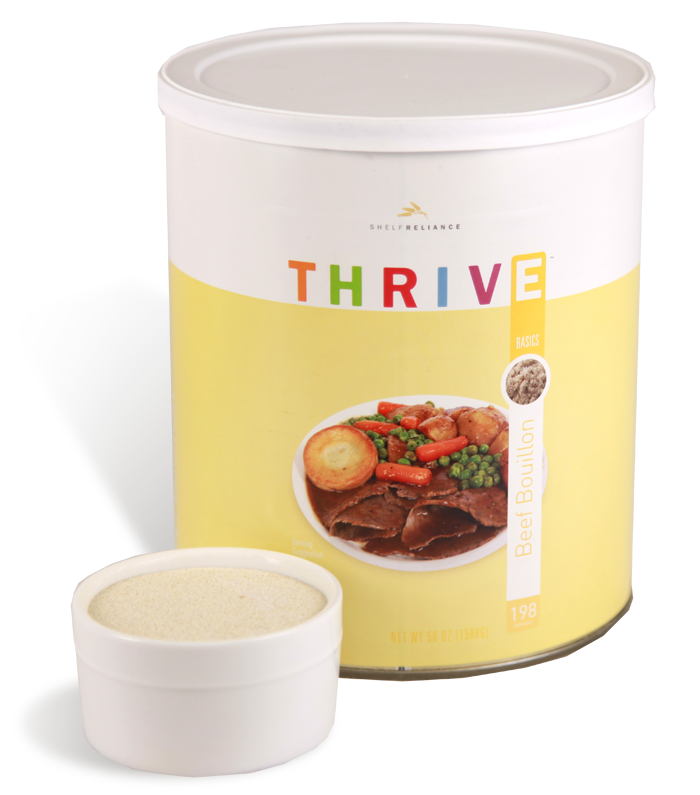 Add Thrive Beef Bouillon to your kitchen cabinet or food storage supply. Maltodextrin, salt, autolyzed yeast extract, vegetables (carrot, celery, garlic, onion), natural flavor, caramel color, spices. CERTIFIED GLUTEN FREE (pouches excluded) PROCESSED IN A FACILITY THAT HANDLES MILK, EGG, SOY, WHEAT, AND TREE NUT PRODUCTS. Mix in 1 tsp. Bouillon for every cup of hot water and stir until dissolved. One of the best features of our Bouillon is that it's gluten-free, which can be hard to find in bouillon. They're also both vegetarian, so you can get great meat flavor even vegetarians will love! Use it in soups, stews, and casseroles that need a little more flavor. Try adding some to the water when reconstituting our meats to help them soak up even more flavor.